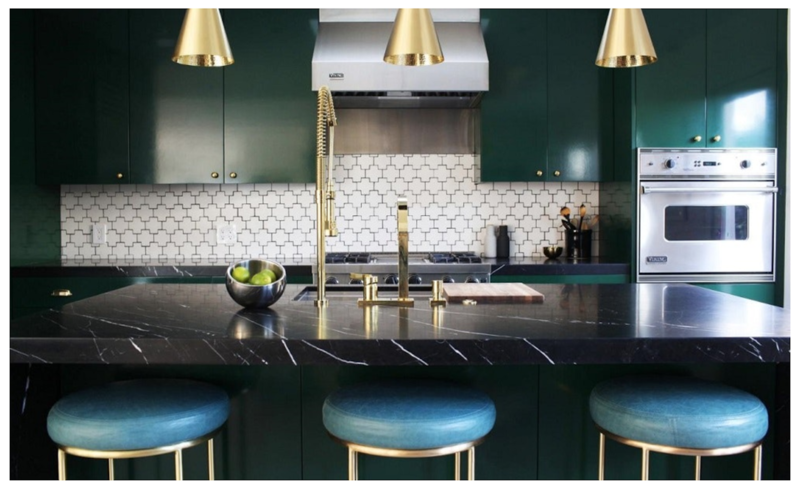 Kitchen & Stone presents you 70 of the best kitchen splashback ideas that you can incorporate to suit your lifestyle. 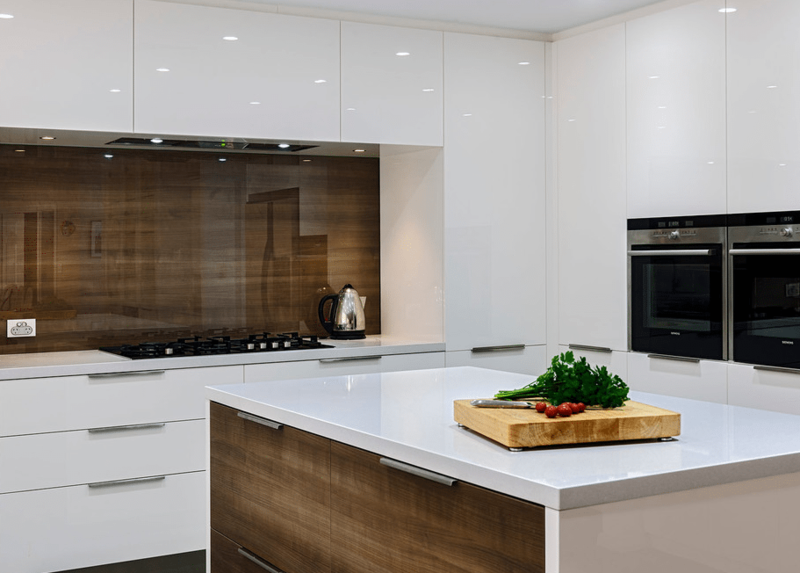 Planning to renovate your kitchen but have no idea where to start? We all know that the kitchen is the heart and soul of any loving and warm home. It has a subtle yet significant impact on you and your family’s mood each and every day. Therefore, it is highly important that you use this to your advantage to plan and design it to suit your desired lifestyle. 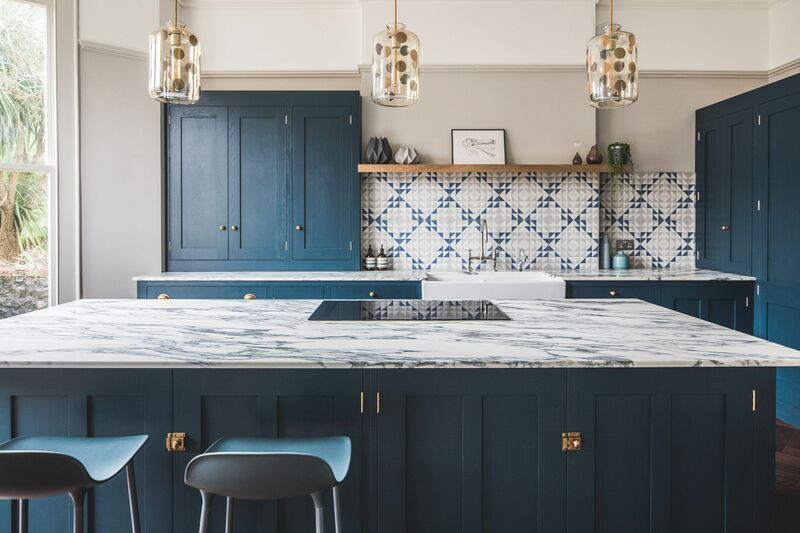 We know it can be tough to decide, so we have compiled 70 of the best splashback ideas in 2018 for you. 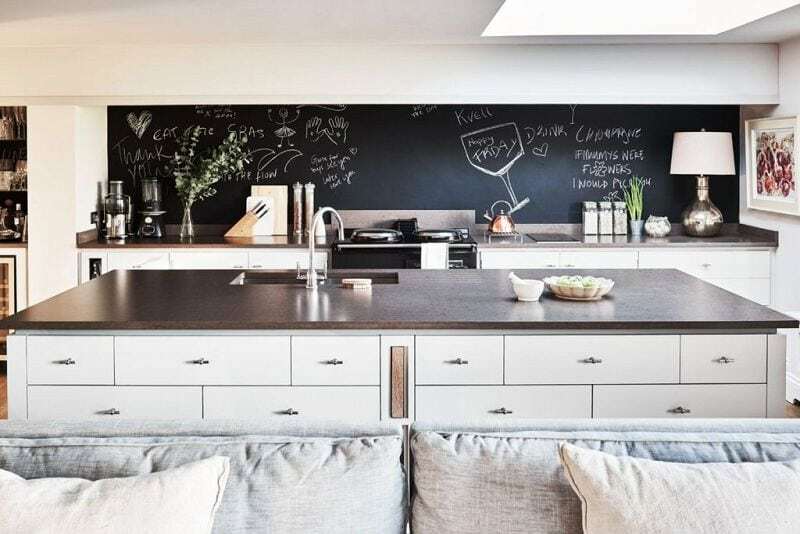 Endless possibilities with a chalkboard splashback. Perfect for the creative household or for someone who simply wants to draw. Freshen the board up with a weekly to-do list. Either way, it looks fantastic on its own. 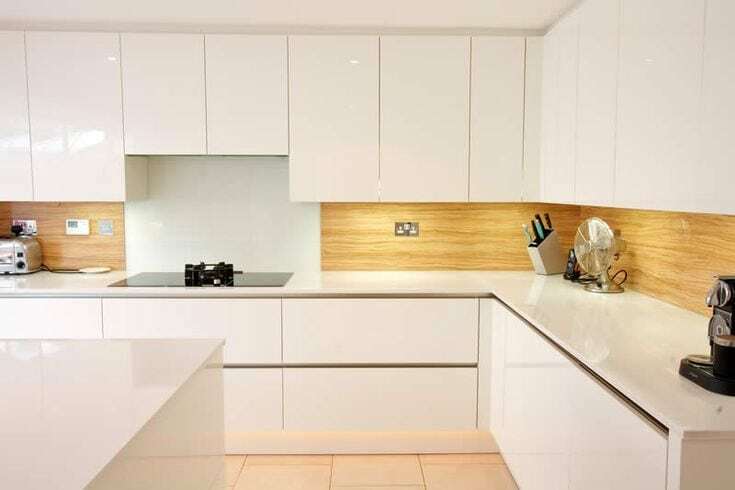 This attention-grabbing splashback will be sure to impress anyone from first glance. Even the young ones. 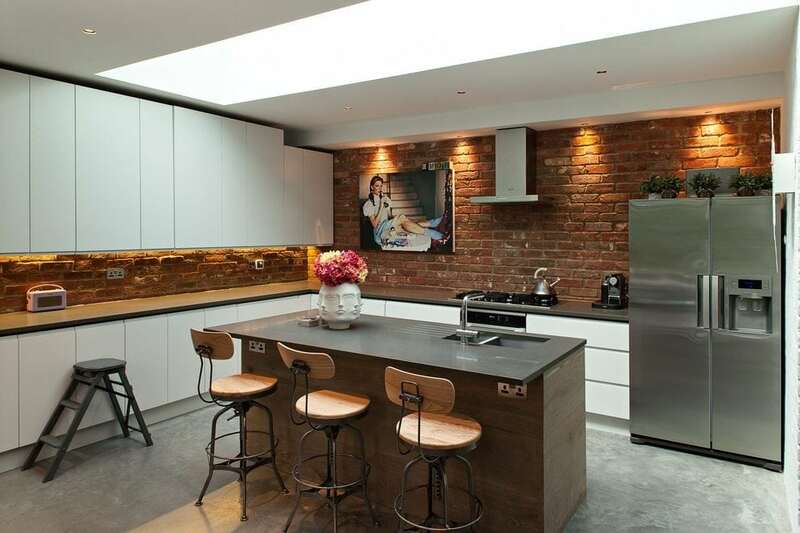 Who would have thought about having exposed bricks in the kitchen? 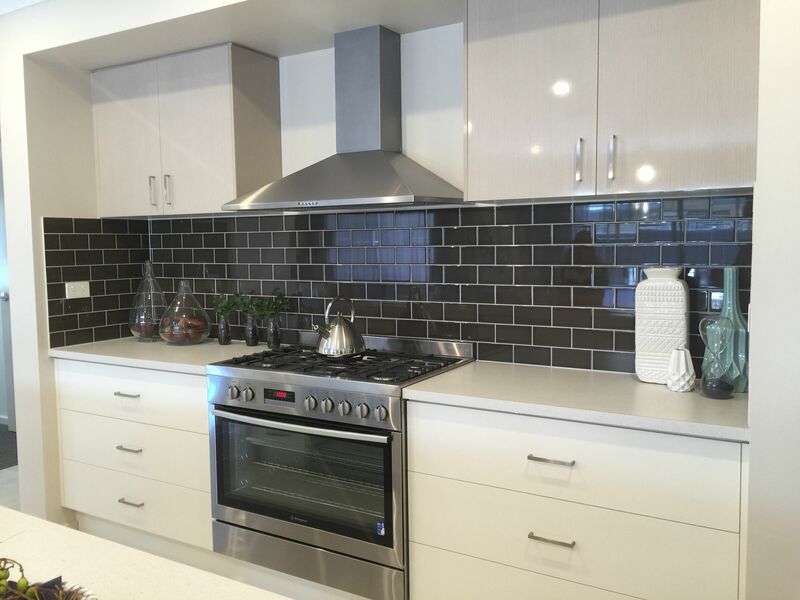 This splashback design provides a warm and urban feel to the home. 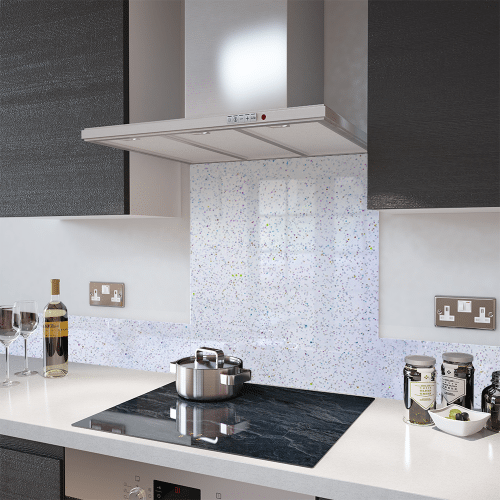 If you love a classic yet powerful look, you’ll love this splashback. This timeless display is sure to stick around for a very long time. Soak yourself with the extravagance of this Burberry-inspired pattern. The mixture of white, black and yellow emits a tranquil vibe within the home. Not your average splashback. 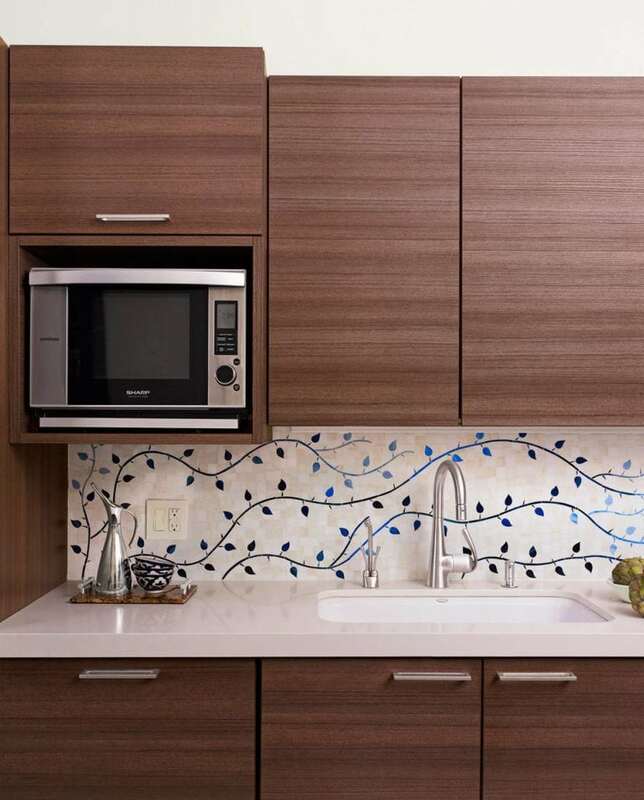 This cool wavy design gives your kitchen a very modern and funky look. 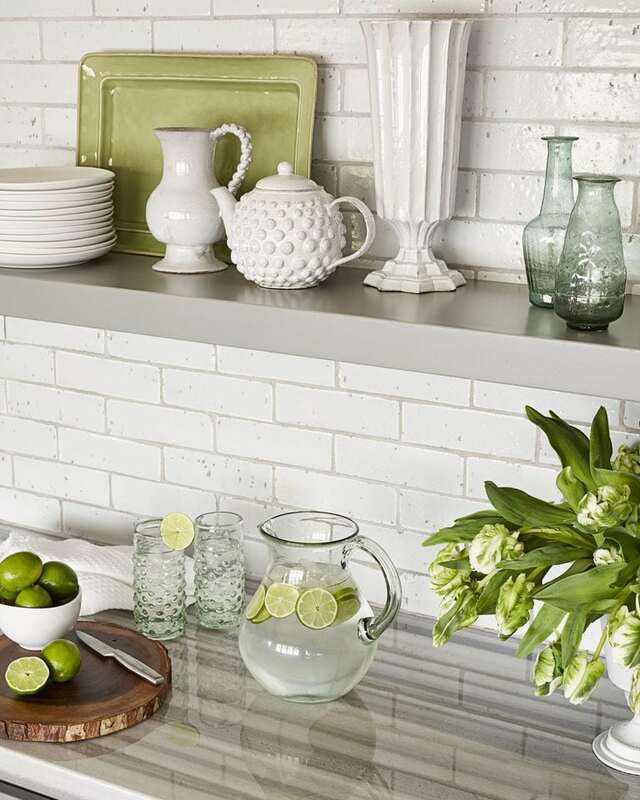 Revive your kitchen with this climbing vine splashback. It feels like there is a feeling of constant growth from the twisting and turning of the vines. 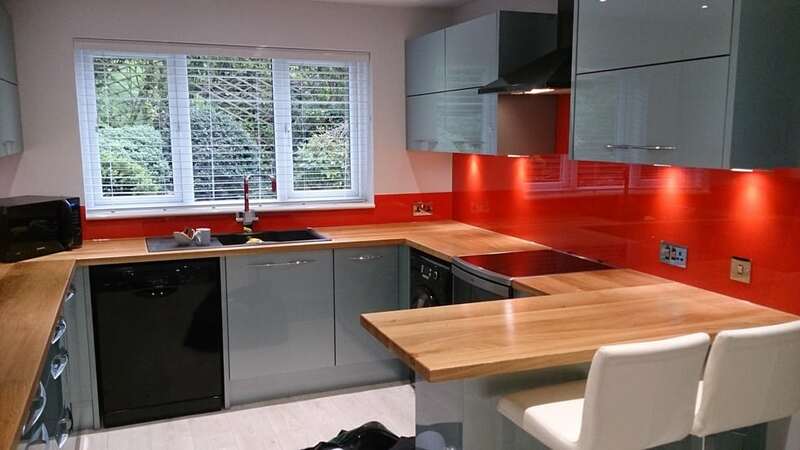 Brighten the home with this hot red splashback. It is simple yet effective when contrasted correctly with natural dark-colour tones. This unorthodox design presents a sense of creativity and renewal in the kitchen. Your home will always feel refreshing. You don’t always have to go with a parallel pattern. These octagonal tiles are a classic and timeless design for any home. 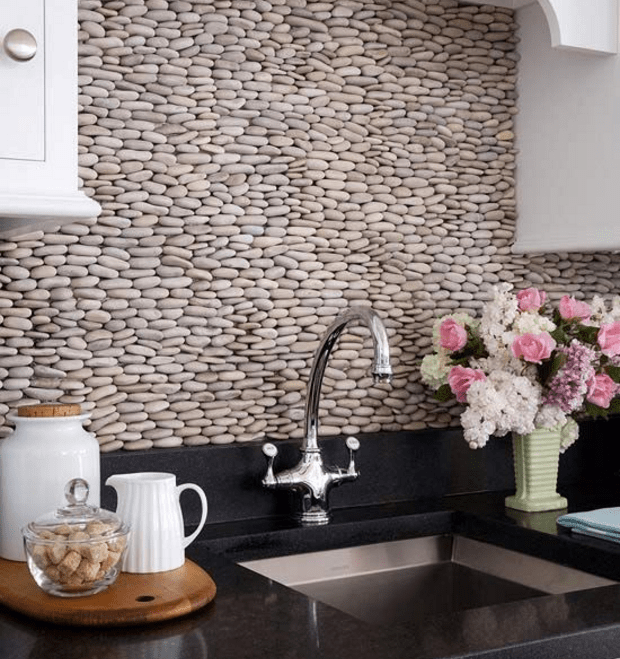 The bulging stones on this splashback provide depth and an extra element to the kitchen to make it feel sensational. 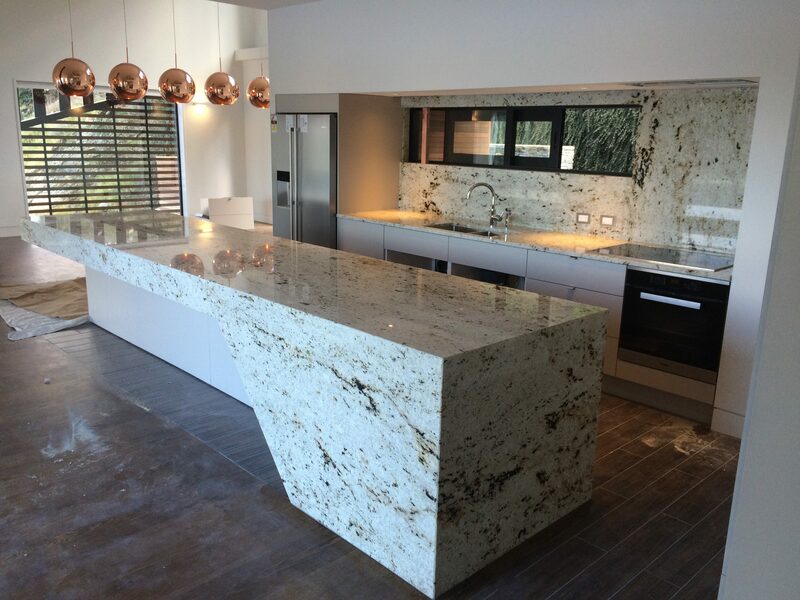 Nothing says elegance like a granite splashback and a granite benchtop. 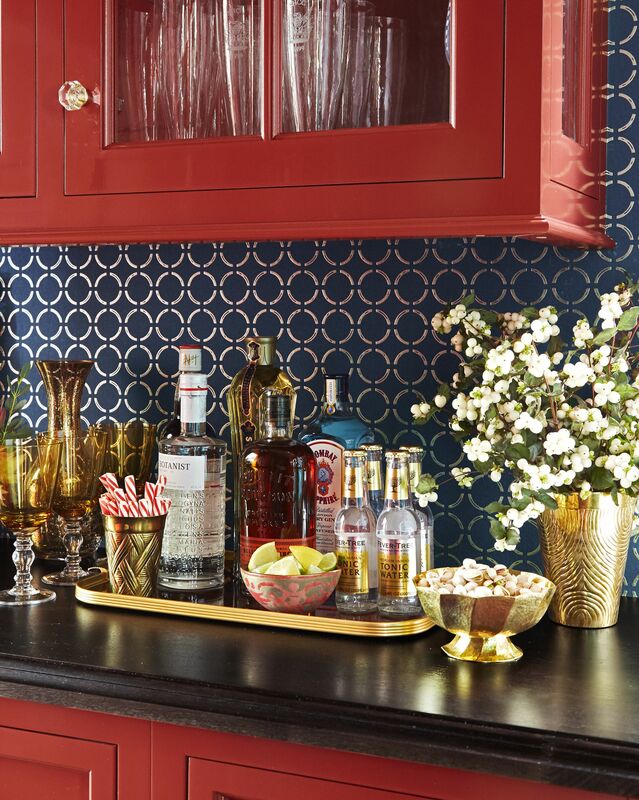 This combination will be sure to make a statement to your guests. How can you pass up on this majestic white design? 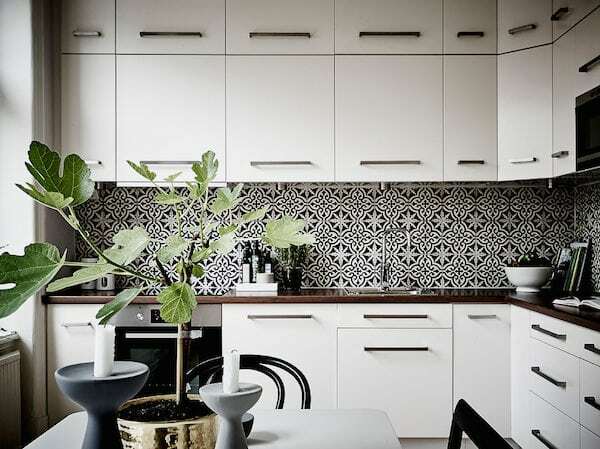 The glazed tile gives a very contemporary feel to the white cabinets. 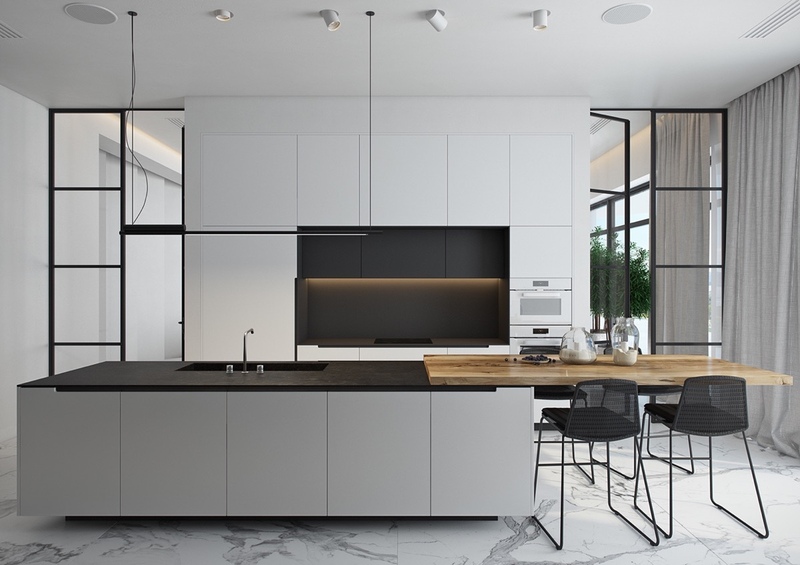 This glossy black and white kitchen is the epitome of luxury. You will feel like you are in a whole new world standing in this kitchen. 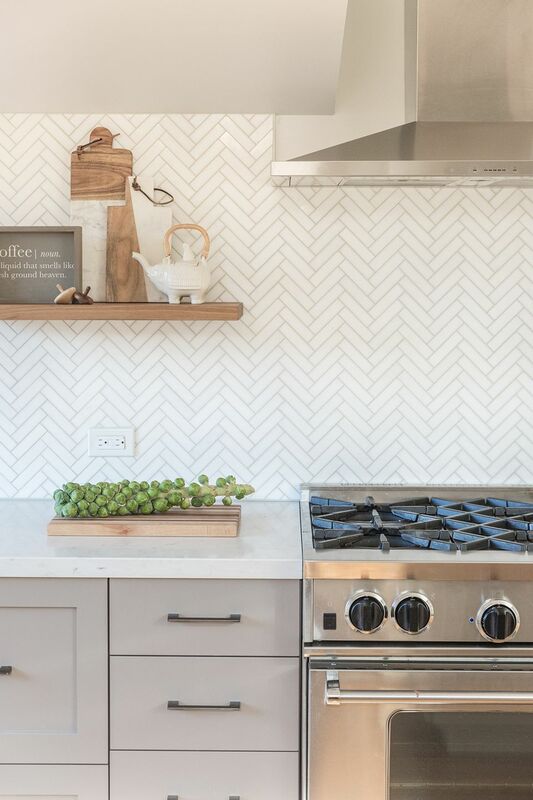 This fabulous herringbone pattern introduces a homey feel to the kitchen. 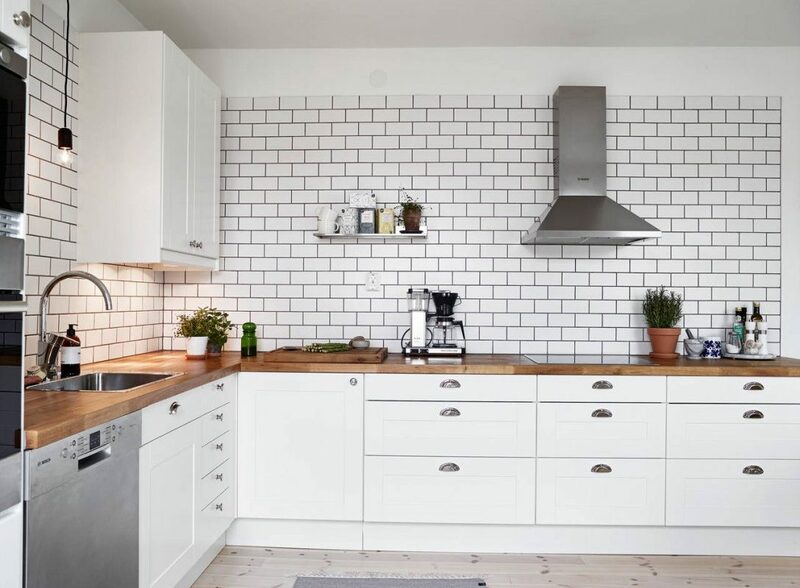 We love this simple yet stylish splashback. 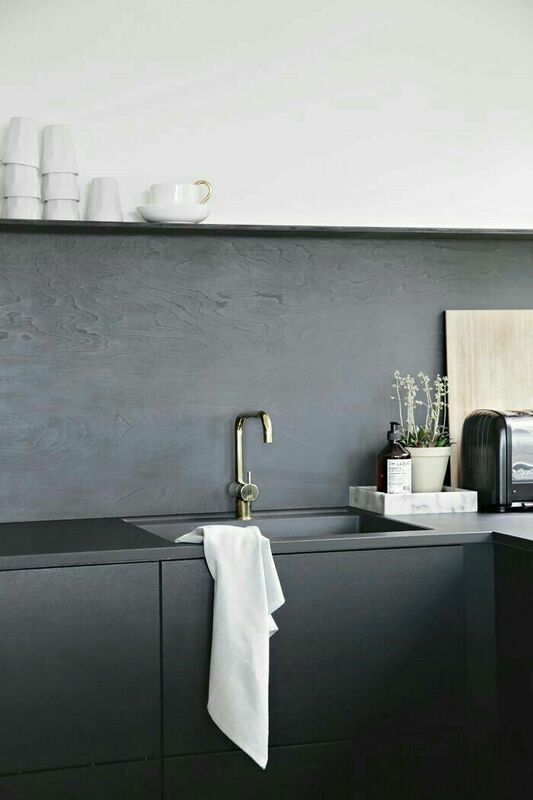 This sleek grey splashback goes exceptionally well with soft and creamy colours. You can’t go wrong with this balance of tones. 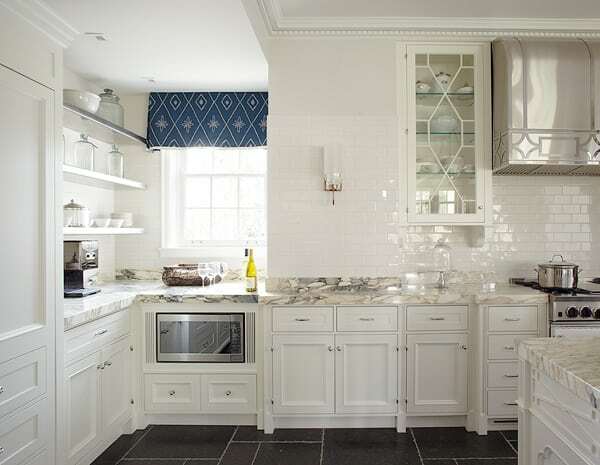 We simply love the calmness in this kitchen given off by the navy cabinets and marble tabletop. The two colours create a coastal feel where you spend relaxing. 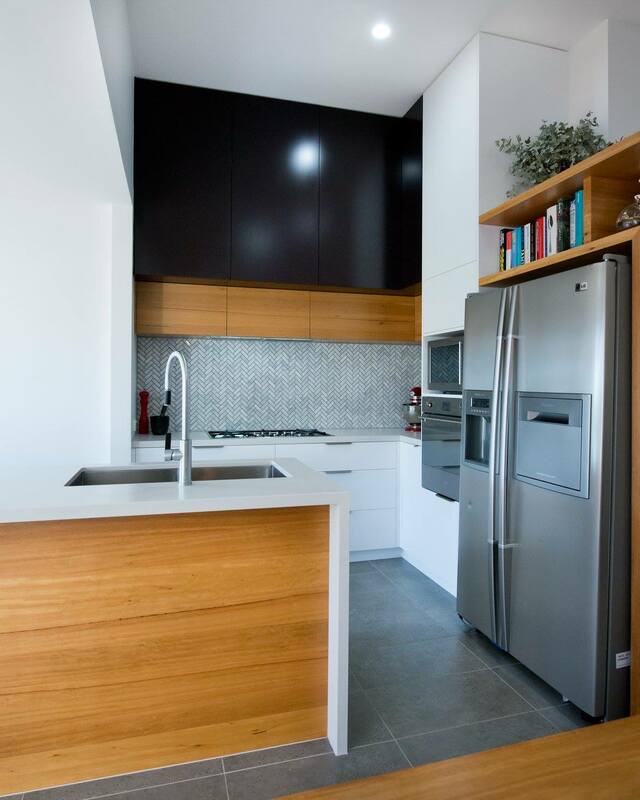 Nothing says a modern kitchen like stacked wooden splashback. 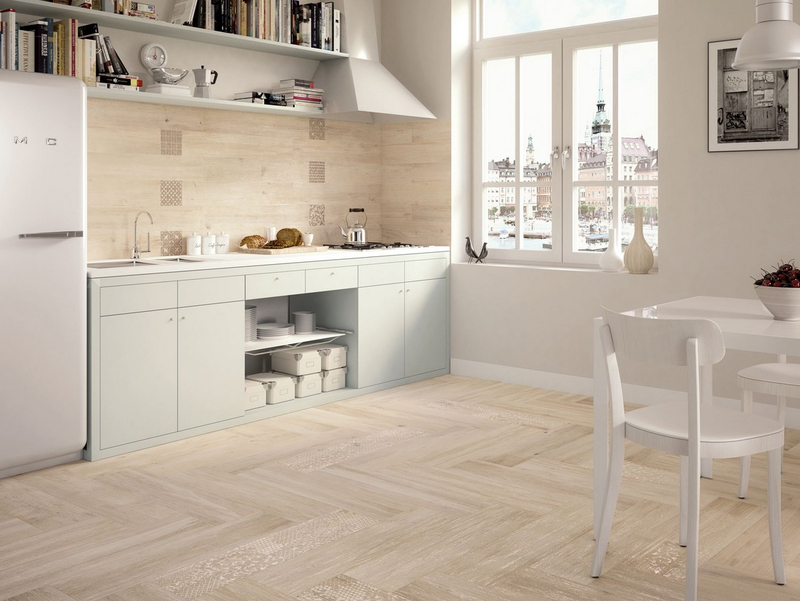 Known for its insulation properties, the wooden look gives a warm feeling to the kitchen. 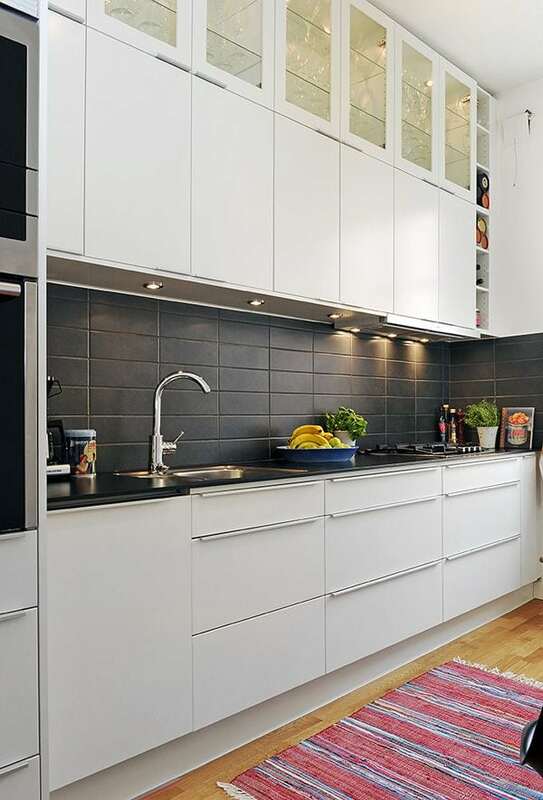 This mermaid-inspired splashback has an urban feel to the home. The balance between the dark-tone wall and white shelvings goes hand in hand. 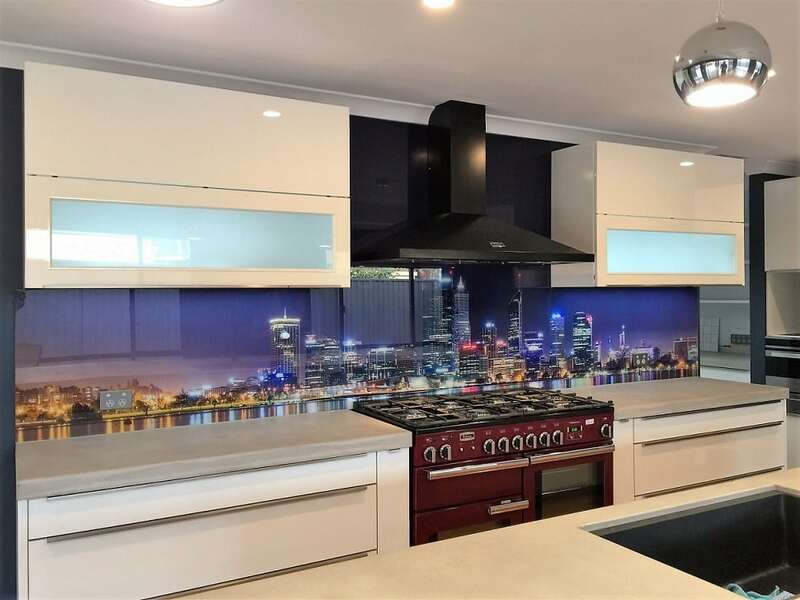 If you love the city nightlife and love looking at the beautiful skyline, this is the perfect splashback for you. Everybody loves the minimalistic look. Keeping it simple and clean is the modern trend. Take a step back and enjoy this astonishing pattern. 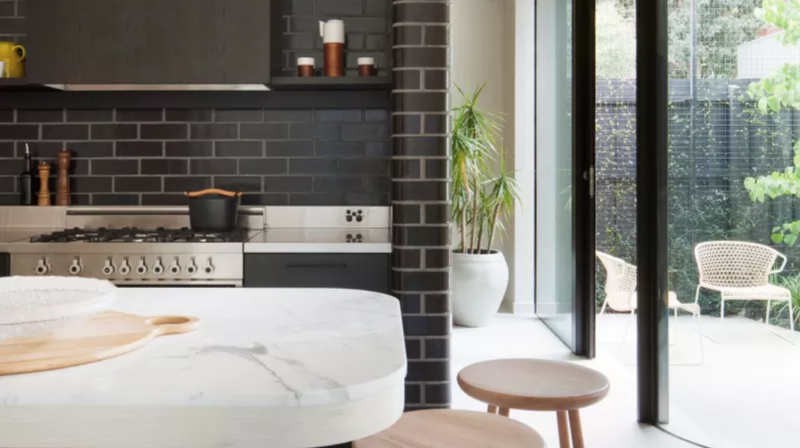 This design fuses the old world with the new world through a balance with the marble benchtop. 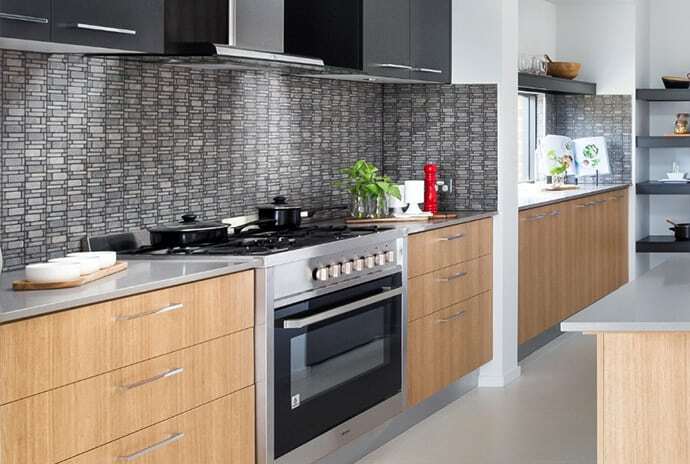 The dark-toned timber splashback creates a powerful impression. This is harmonised by the clear glass to give a luxe finish. Enjoy the warmth of the natural sunlight with a clear window. 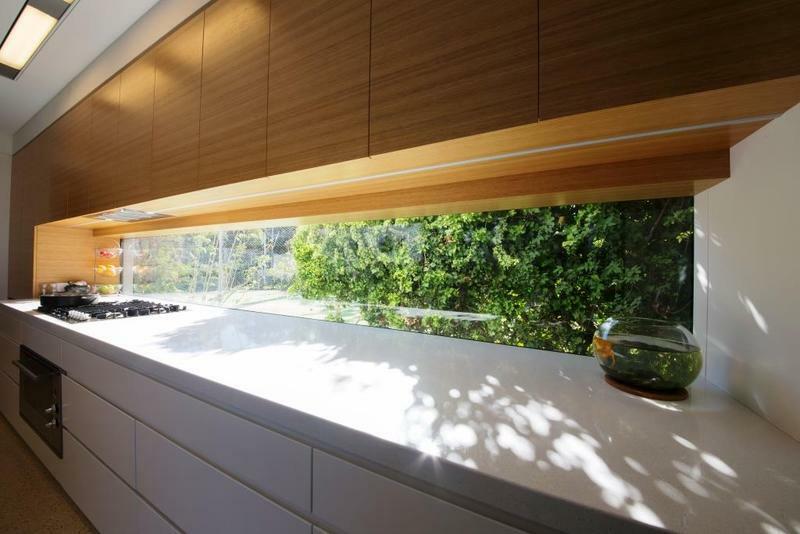 This design works for kitchens with an unobstructed view. 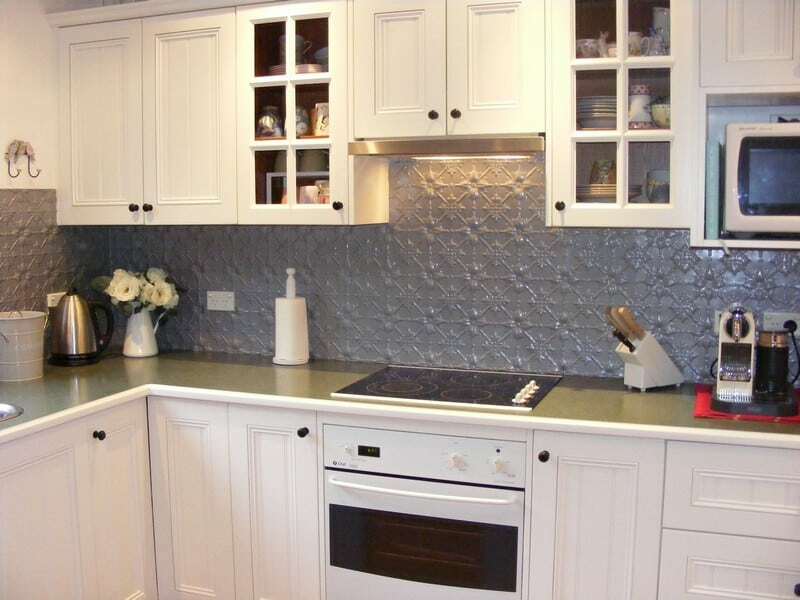 This amazing metallic look really shines your kitchen and adds personality through its texture. Throw in a touch of age with this weathered wall. This lovely splashback will be sure to resonate with anyone working in the kitchen. 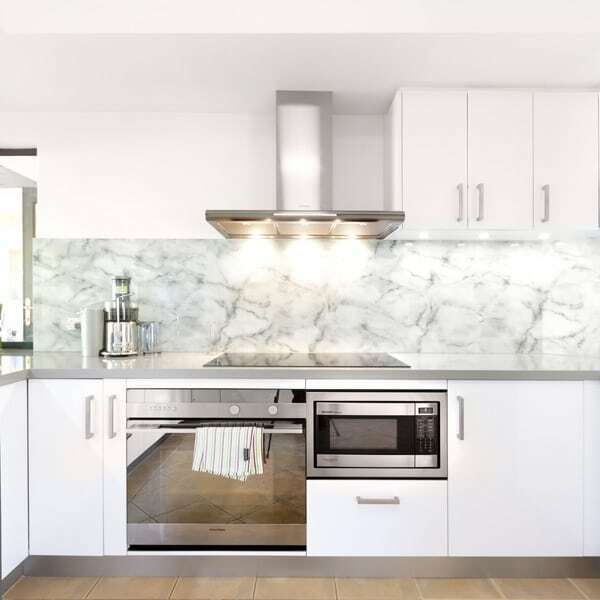 Feel enlightened every time you step foot into the kitchen with this marble splashback. The butterfly pattern creates a cool and peaceful cooking environment. 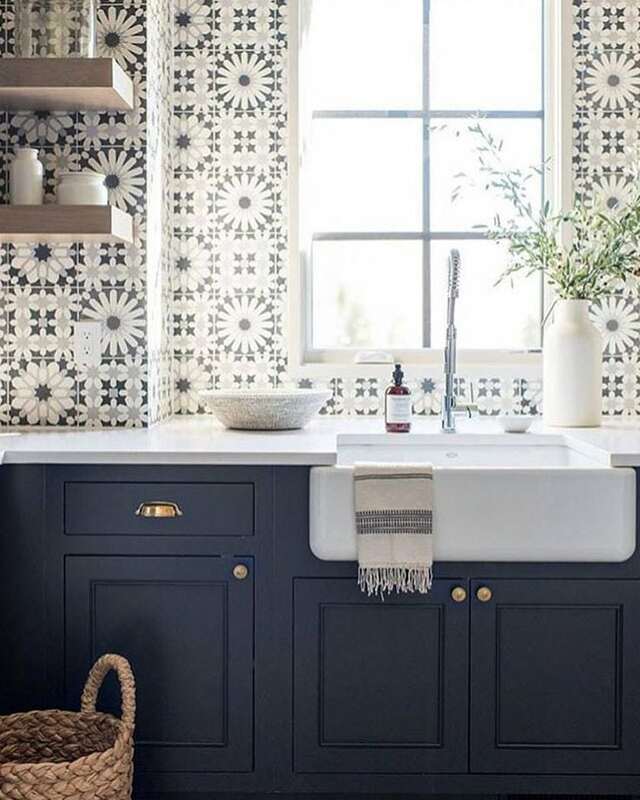 Who doesn’t love this monochrome kitchen? Its simplicity and elegance give a very contemporary feel to the overall home without anything too sparkly. 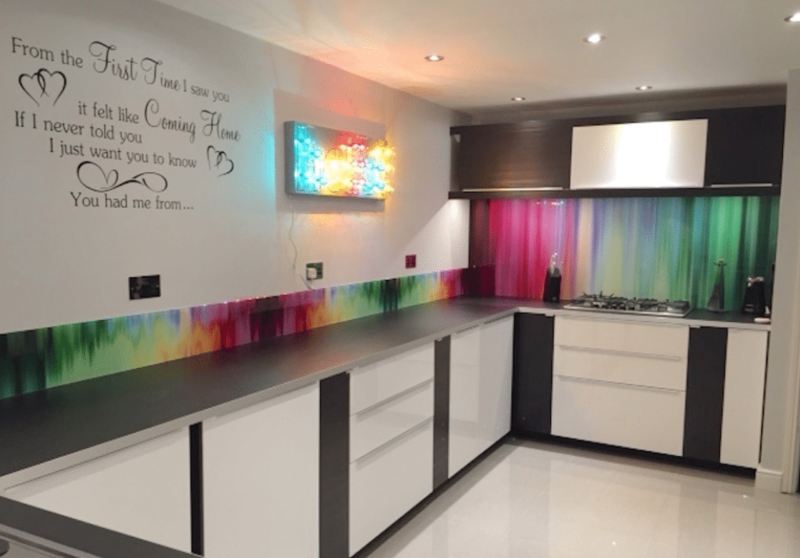 Feel energetic and alive with this rainbow splashback. You will forget that you ever had any problems in your life. 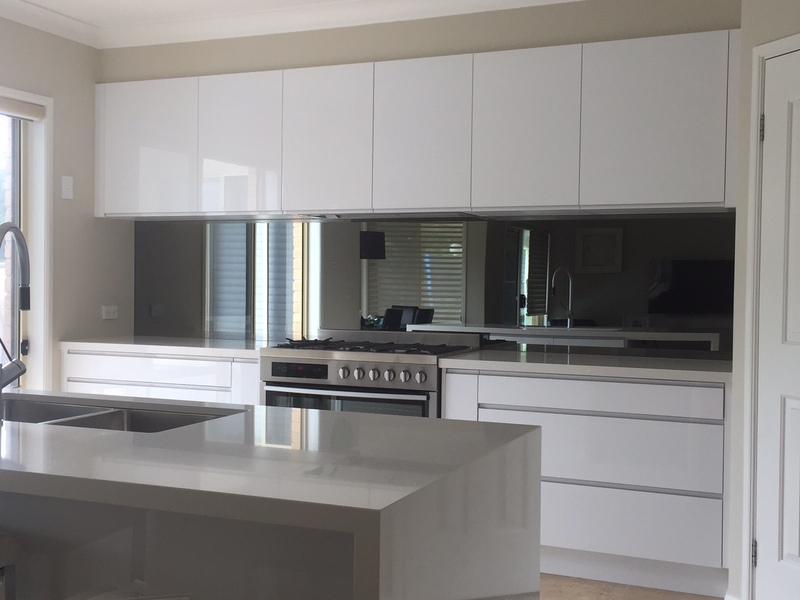 Having a tinted mirror over a simple clear mirror is often preferred to create a stronger contrast with the white cabinets. The mirror creates a more spacious feel to the room and is perfect for any home. 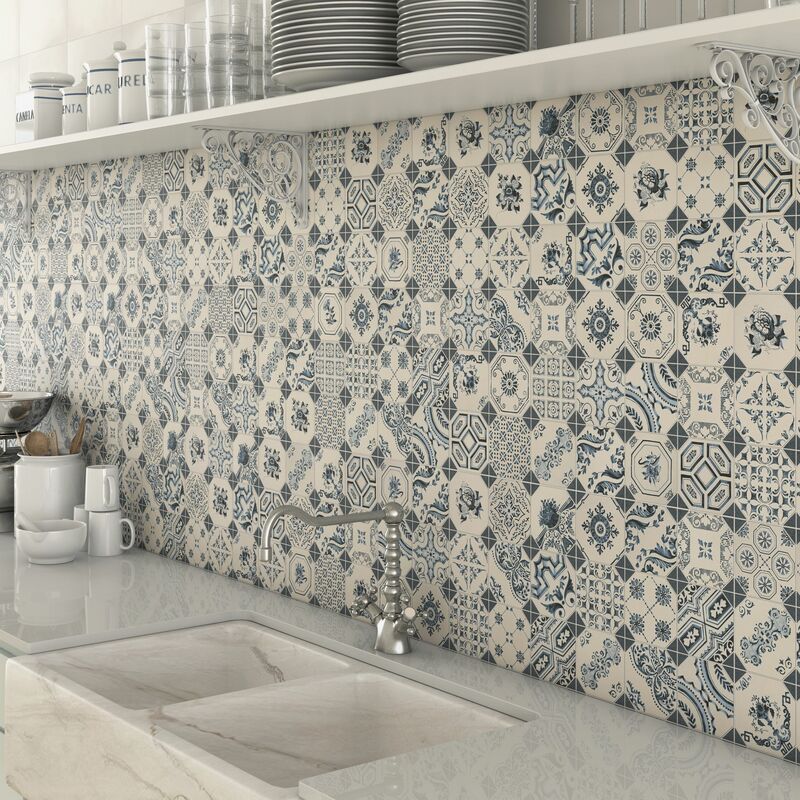 Splash some life into your kitchen with these beautiful Moroccan tiles. The exquisite patterns and shapes offer a nice visual to your home. Get that Scandinavian feel in your very own home. The warmth and calm feeling will make you want to stay in this kitchen forever. 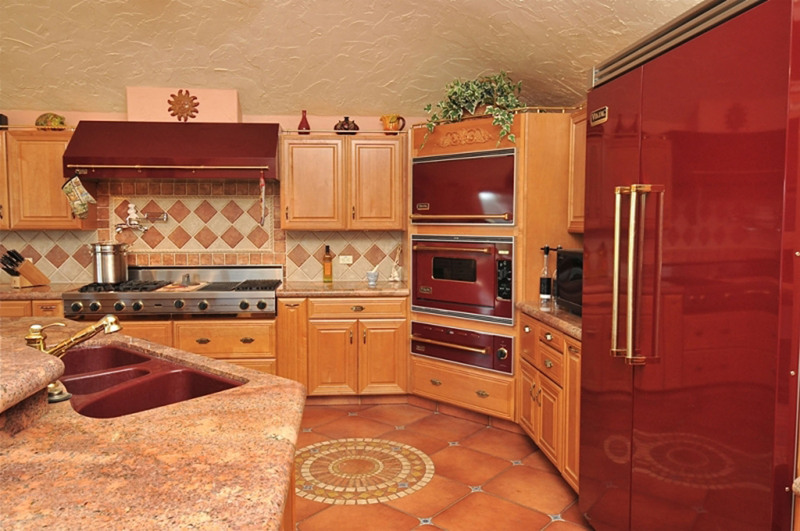 Make a statement with this retro looking kitchen. The juxtaposition of the colours in conjunction with the soft timber flooring creates an ambience mood. 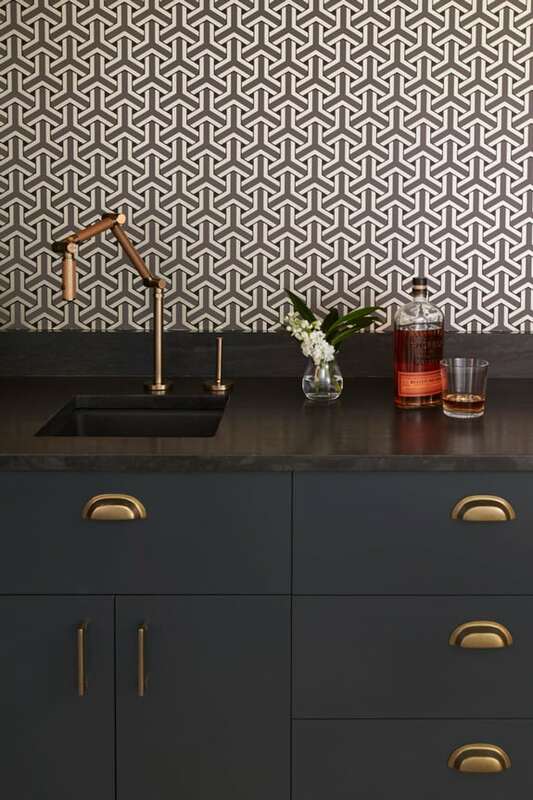 This dazzling pattern along with the dark cabinets and gold handles provides a luxurious feel to your home. 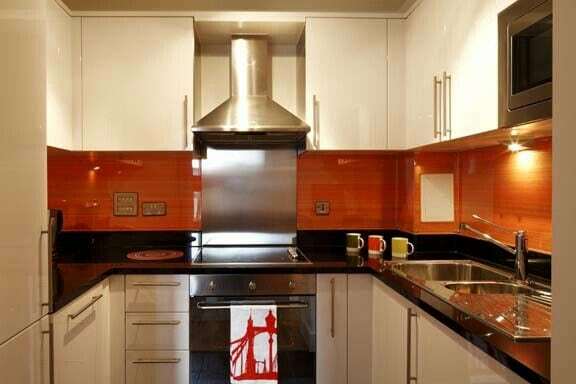 Start your day off on the right track with this bright and lively Moorish splashback. 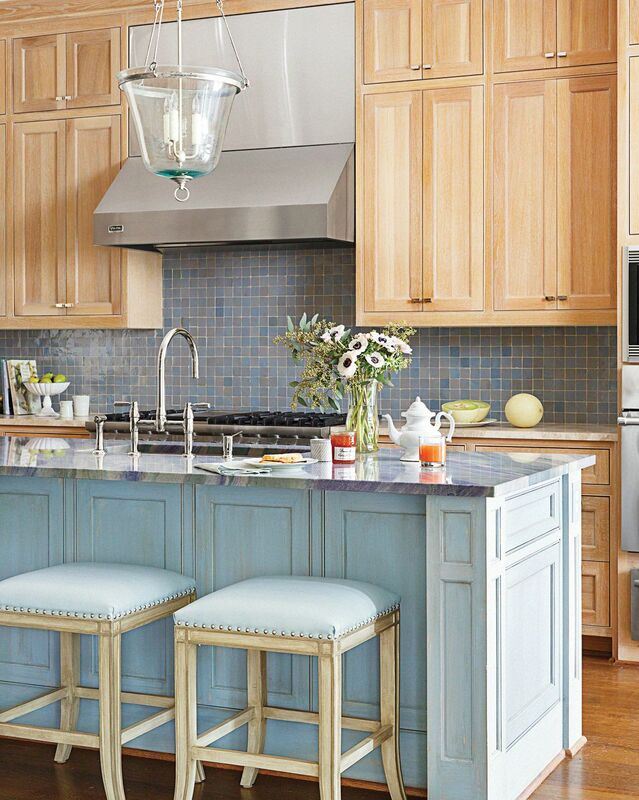 The soft blue works great with the overall white of the kitchen. Have you ever considered combining timber with tile? 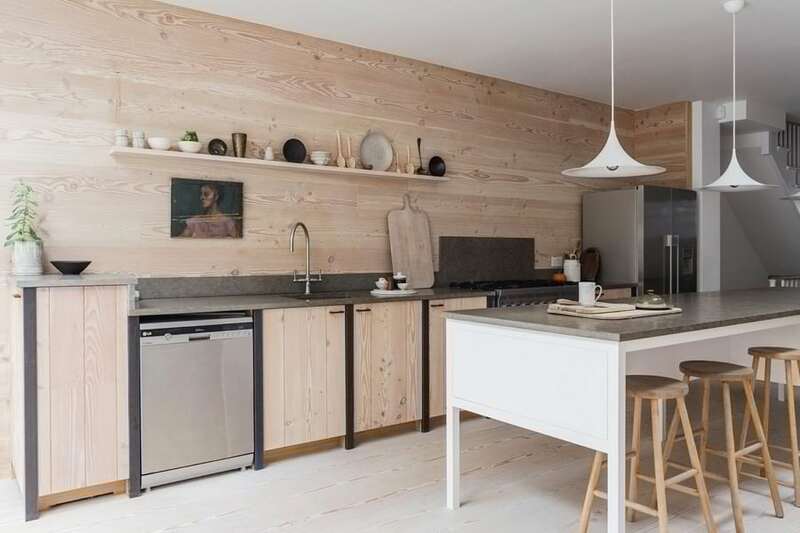 This surprising mix will give your kitchen a light glow and complements the wooden floorboards. 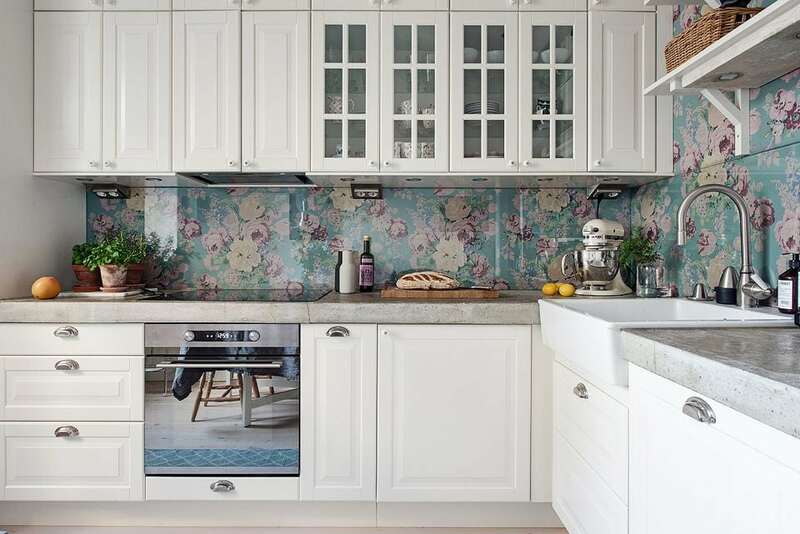 If you are looking to avoid bright and distracting colours yet establishing a pleasant atmosphere, try this beautiful floral splashback. 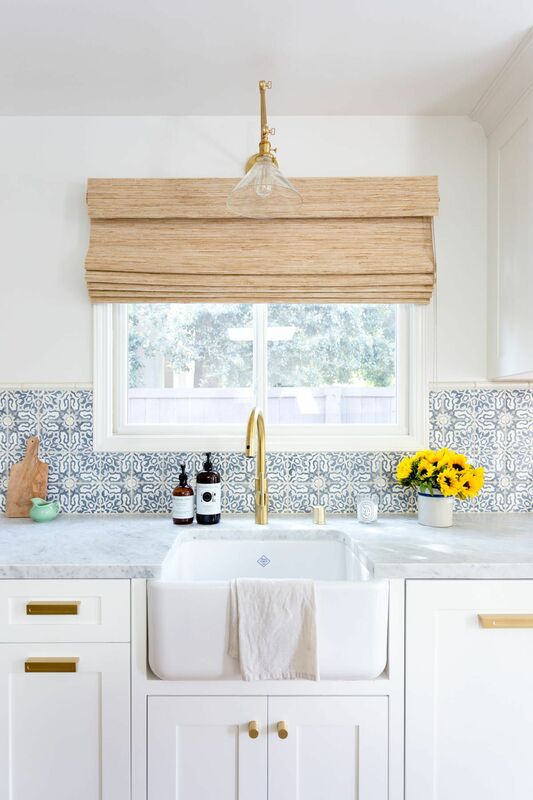 Clean, lovely, welcoming, is what this kitchen screams. The wooden panel provides the room with a soft and neutral touch that isn’t too overwhelming to the overall look. No, cobblestones are not only limited to road and wall construction. 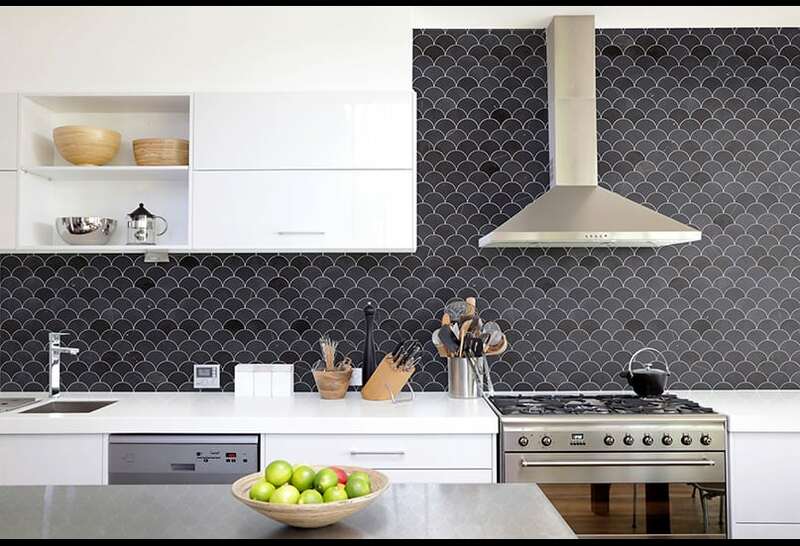 It is also used in creating a kitchen splashback. 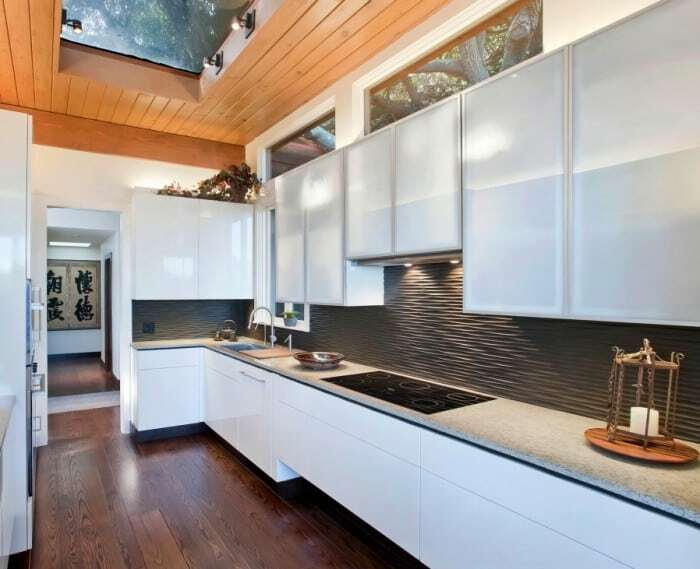 This creative splashback is both intriguing and impressive. 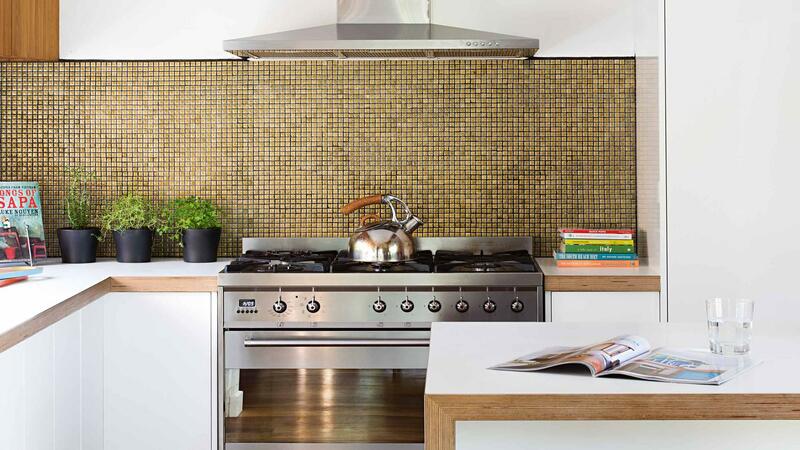 ‘Wow’, will be the first thing that comes out of your guest’s mouths upon sighting this splashback. These massive stones are not only impressive but extraordinary. For all you sea lovers, this is undoubtedly the right choice for you. Match it with a couple of ocean theme decor and you’ll feel like you are out in the ocean at your very home. 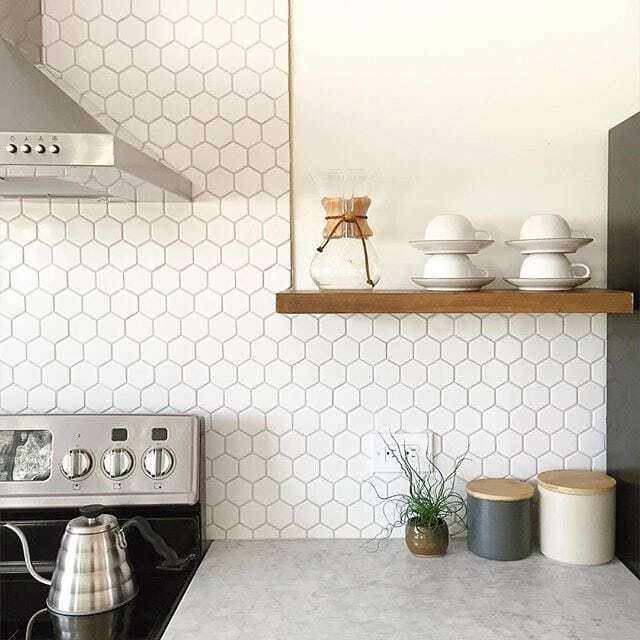 This unique splashback adds a rejuvenating feel to the home. There are connotations to prestige given off by the metallic look. 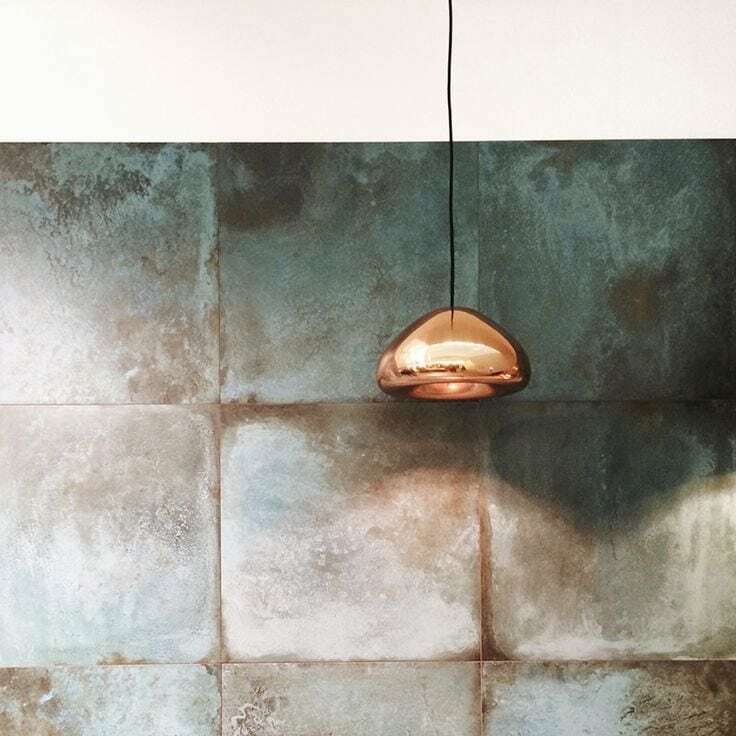 Combined with neutral colours, this oxidised look is very relaxing. 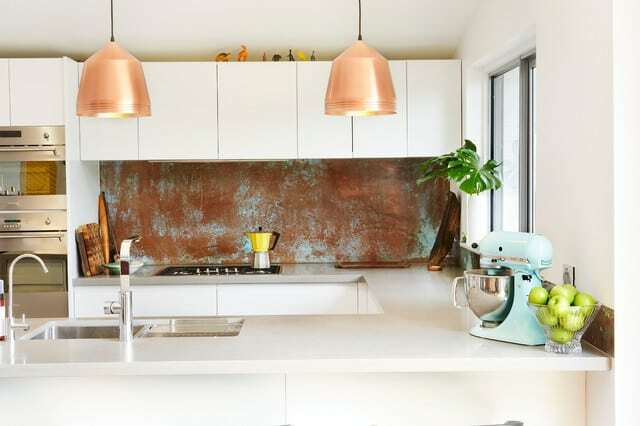 Insert some copper tapware and metal finishes to the mix to complete the industrious feel. Don’t be scared to try a dark-toned orange in the kitchen. Contrast it with some bright and neutral colours to produce a historic home resembling those during the Victorian era. The stainless steel appliances are complemented remarkably well without being overpowered. 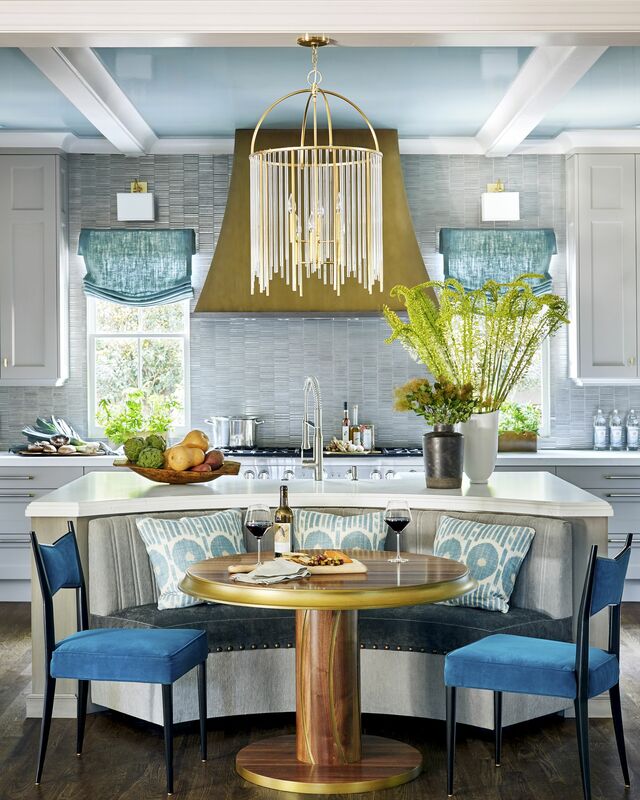 It adds a feeling of exotic and glamour to the kitchen atmosphere. This mixture of dark and light grey tone goes well in almost any home! 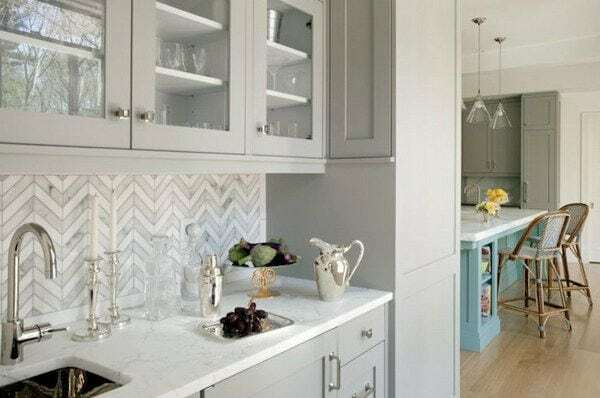 The irregular grey tiles create an iridescent splashback. Do you enjoy this beautiful glossy charcoal as much as we do? Combined with creamy white colours and you have the perfect modern kitchen that everyone will envy. Bold! 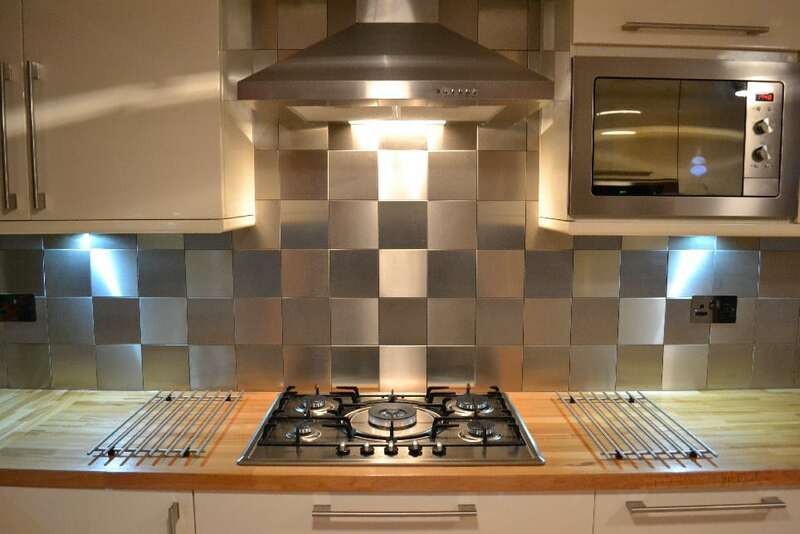 This splashback speaks bravery and confidence. Get motivated every day to do something daring with this splashback. Nothing says elegance much like the material marble. The vibrant and cheerful aura of the kitchen is enhanced by the marble tabletop and complete white cabinets. 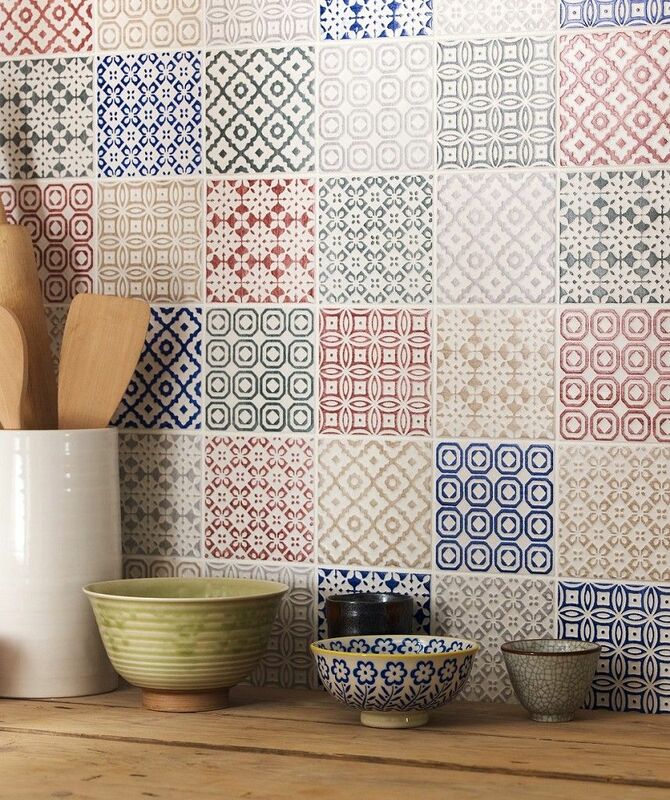 For those who love the traditional Mediterranean kitchen look, the terracotta tile splashback is the way to go. It will remind you of those feelings of comfort and coziness at home. 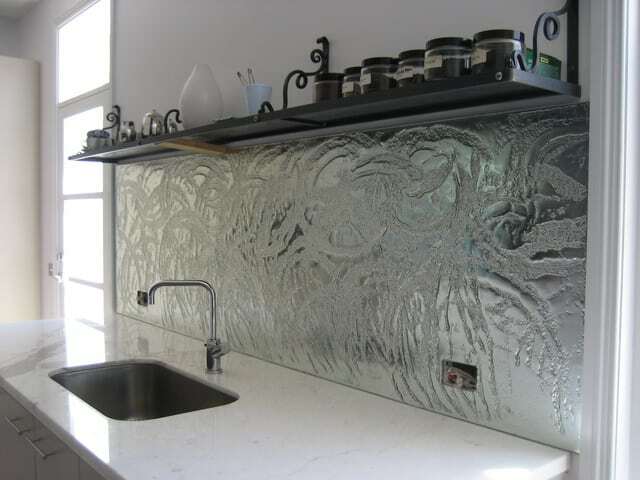 Get this seamless and extravagant splashback goes perfectly with additional touches of metallic decorations. It enhances the status of wealth and sophistication. 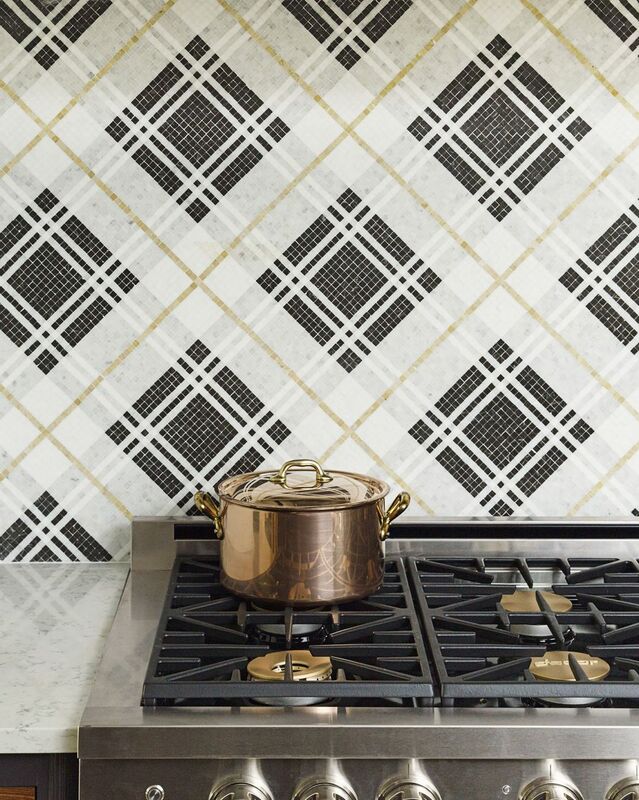 The intricate pattern on this pressed metal splash adds depth and character to your kitchen. 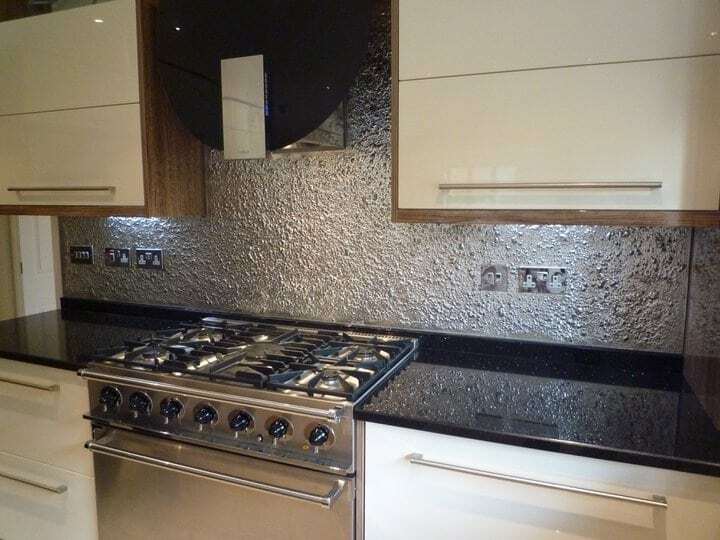 A fantastic way to bring your kitchen to life is through a speckled glass splashback. It offers the openness of a white wall without looking too basic. The intense print creates a dynamic environment so you can always change it up with different decoration theme to spice it up. 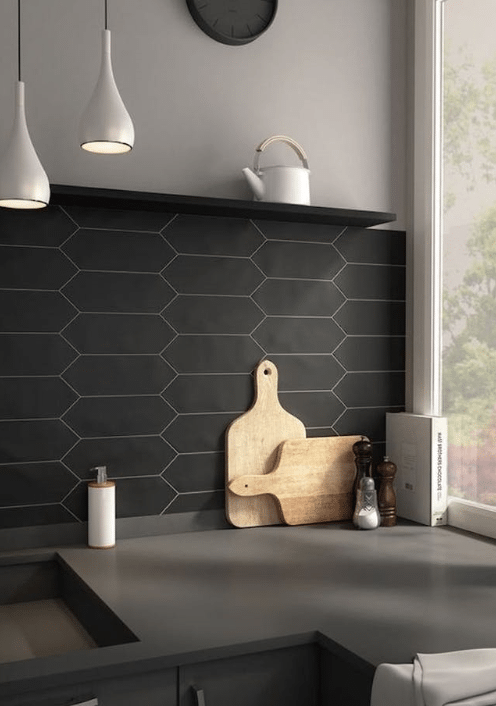 The combination of the white geometric pattern and dark black grout executes a seamless splashback to give you a complete look with dark-tone fixtures. You won’t ever get enough of this sensational marble tile. The soothing grey colour brings about a homey and serene feeling. The secret to a beautiful kitchen is to maximise the natural light in your kitchen. 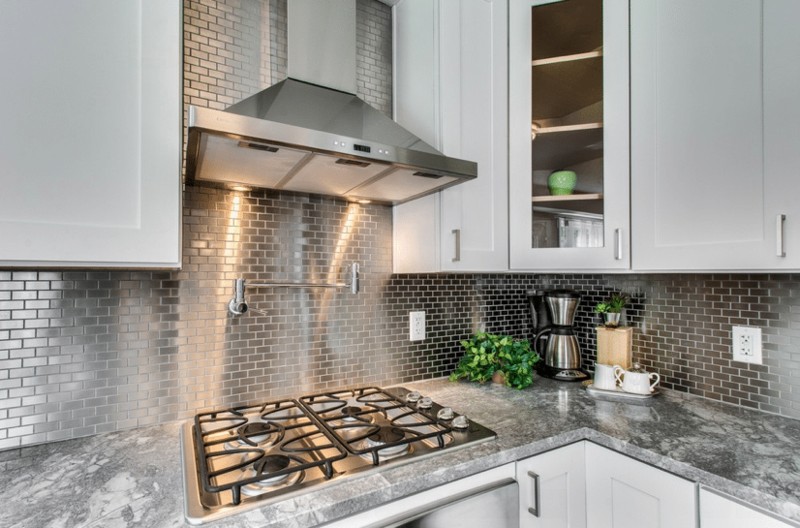 This silver silk splashback is the perfect tool to do so. The natural colours and low shine from the stony grey creates a peaceful and quiet kitchen. Nothing too exciting but very calming. 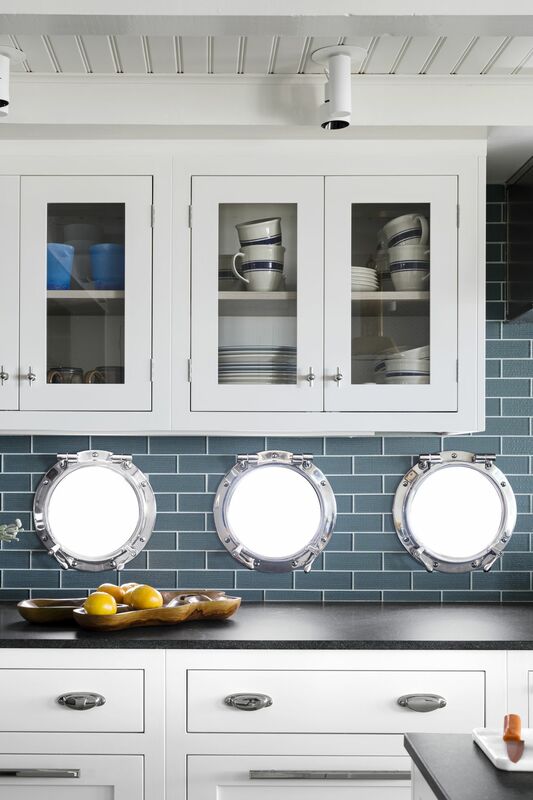 This timeless splashback works anywhere and anytime. Exceptional for brightening up the kitchen for those with not much natural light. Glamour and deluxe are the first two things that come to mind when seeing this beautiful design. This unique splashback is to die for! Have you seen anything more tranquil? 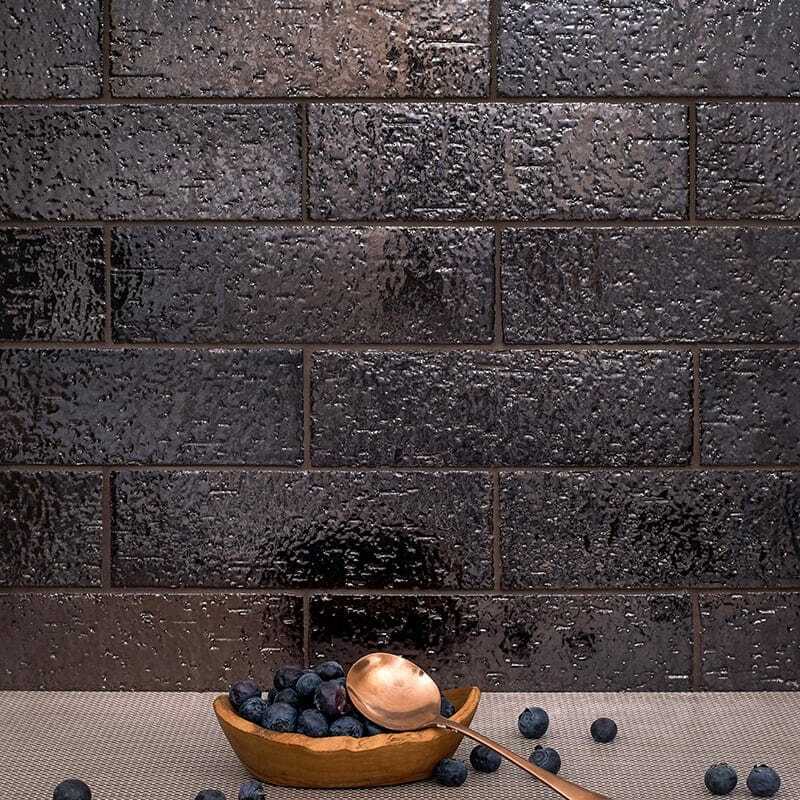 This rendered charcoal brick offers a much more elegant and peaceful outlook to the kitchen. There is an atmosphere of coziness emitted by the warm tones of this patchwork. 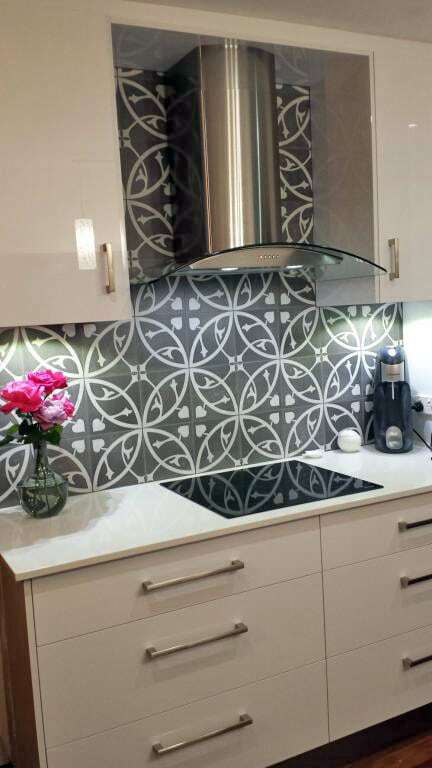 If you are looking to juggle between a modern and industrious design then this is the perfect splashback for you. The combination of both gives a spectacular modern interior look. 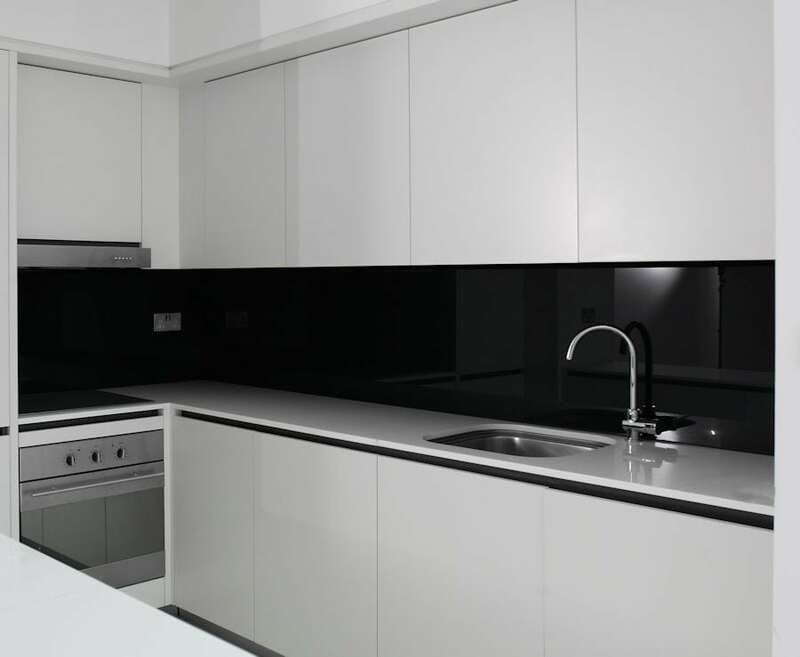 This magnificent splashback makes a bold statement with its pure dark-tone. 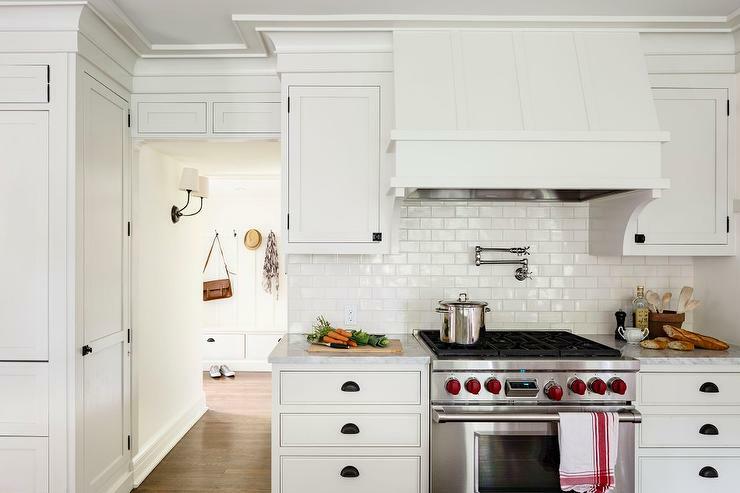 Offsetted by the natural white, offers an appealing visual element to the kitchen. Sick of the bright and feminine composition? 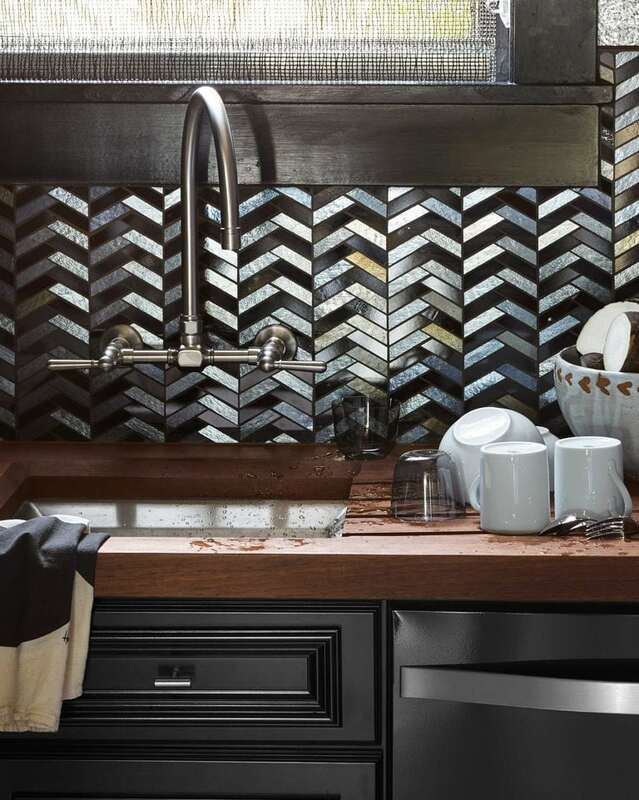 Cover your kitchen with a theme of dark hue of grey. It speaks class and sharpness. 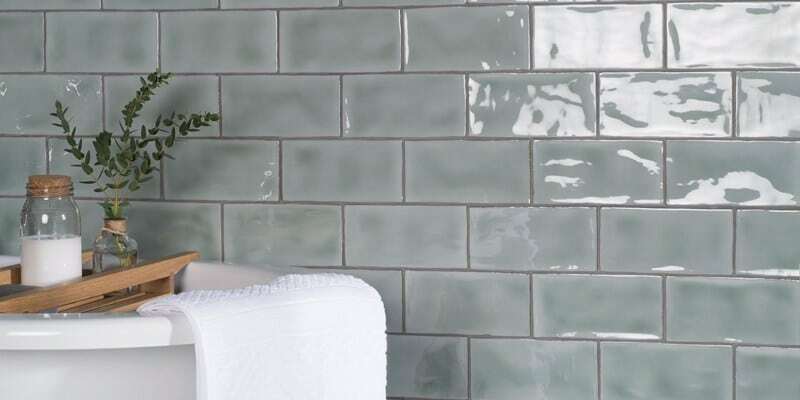 We really love this mesmerising glossy tile. 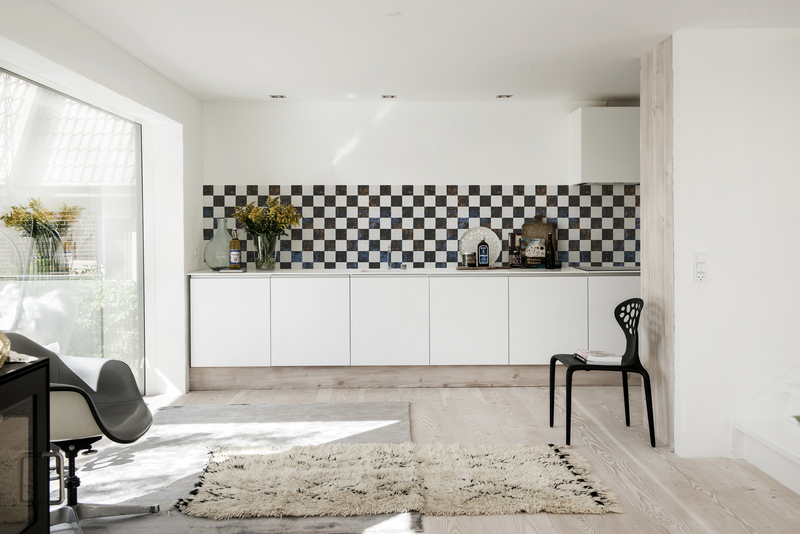 It evokes a feeling of gentleness in a contemporary kitchen. Matte black is perfect for any minimalist. It represents a simple and elegant lifestyle that doesn’t involve any complications. 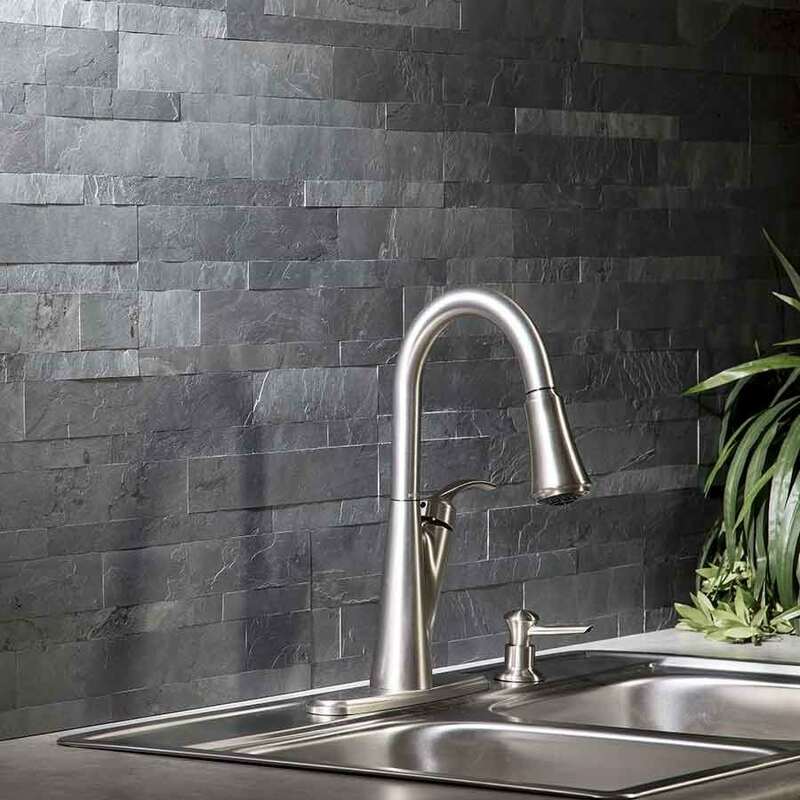 The matte texture will have your kitchen feeling more spacious, natural, organic and warm. Feeling exotic? 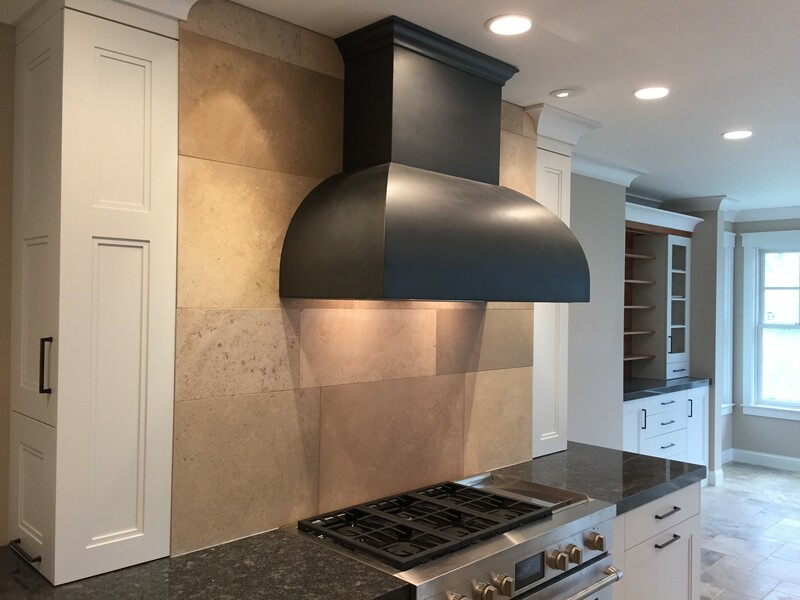 The grey shades offered by this splashback generates a subtle excitement mood in the kitchen. 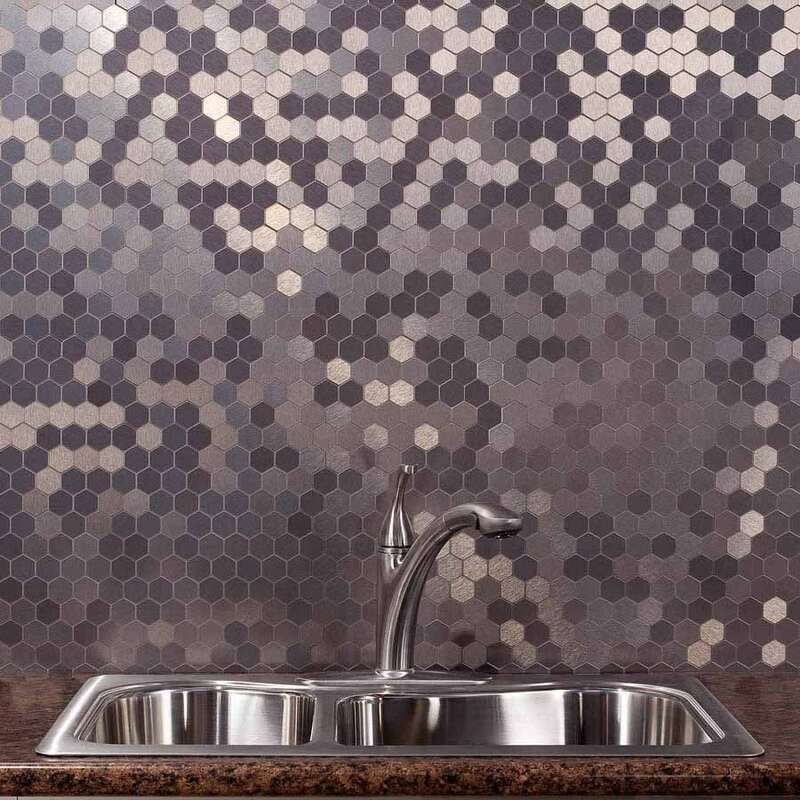 Spoil yourself with this mosaic of gold tiles. The captivating look lends a little bit of luxury without overpowering the overall design of the kitchen. 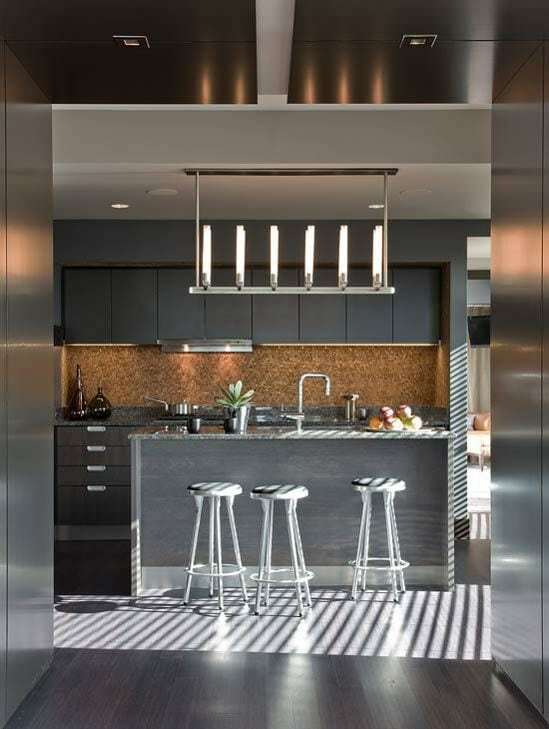 This heavy tone of glazed black challenges the idea of a sleek and transparent kitchen. However, this dark colour will slowly grow on you over time where you will have an appreciation of it. 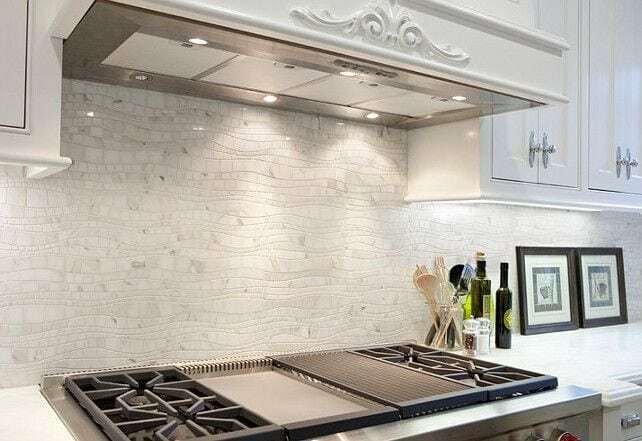 No matter what type of kitchen splashback you desire, Kitchen & Stone will custom make your splashback to turn your dream and vision into a reality! Which is your favourite kitchen splashback design? Let us know, or ask us for some previous work that we’ve done over our 30 years in professional kitchen renovation.